Sports turf is scoring wins around the world right now, from FIFA stats abroad to schools here in the SF Bay Area. Does your team still play on live grass? Check out who has made the switch sports field turf and why. Then, take a second look at your maintenance costs, injury rates, and water use. Isn’t it time to make a change? We have the new 3Dgrass with cutting-edge science and new fibers for safe play.Our range of sports grass covers price points for all kinds of fields. As water costs rise and the stats on fake lawn’s safety record get better by the year, you can see why artificial turf for campuses and synthetic turf for stadiums makes sense. More and more pro teams pick to go green with fake lawn, and who can blame them? Watersavers has top quality sports field turf, with grass that stands up to hard play while you save money and water. The latest industry news shows field turf may be notably safer than livesod for infield sports like football and soccer. Natural grass and dirt can be soft and slick after rain. That leads to trips, falls, and accidents that cause harm.Artificial grass fields drain fast, and with the right pads and infill, you can reduce the injury risk for games in all weather. No wonder twelve NFL league teams and more than 90Division I Bowl and Championship Division schools play onfake grass.In the world of soccer, the 2015 FIFA Women’s World Cup made newswith its synthetic fields. When all the stats were in, the injury rate at the Cup shrank below the rates of past years. 2015 had just2.1 injuries per match. The 2007 and 2011 Women’s World Cup, and the last four Olympic games were all on natural grass. All of them had higher rates of injury than the 2015 FIFA games that took place on sports field turf.Watersavers has high-quality sports field turf and pads. We carry the latest designs with advanced materials to help keep your teams safe. We have more than 60 grass types, with great picks for golf, bocce, croquet, tennis, and heavy impact games like football and soccer. Our real grass substitutes are major league all the way. The newest advance in lawn replacement design comes in the form of 3D grass. Its goal is to give athletes a riskless field so that they can play safe.This new sports lawn is rigorously tested in independent laboratories around the globe. They run tough wear and tear tests on the material and UV tests on the color. These tests ensure it holds up in real-world conditions all year round. The product is made to the highest standard, for heavy sports usage. It’s engineered blades are built to stay strong and smooth for the long run with a plush face weight of 56.47ounces per square yard.Watersavers is proud to offer the new 3D grass,fresh from cutting-edge research labs. 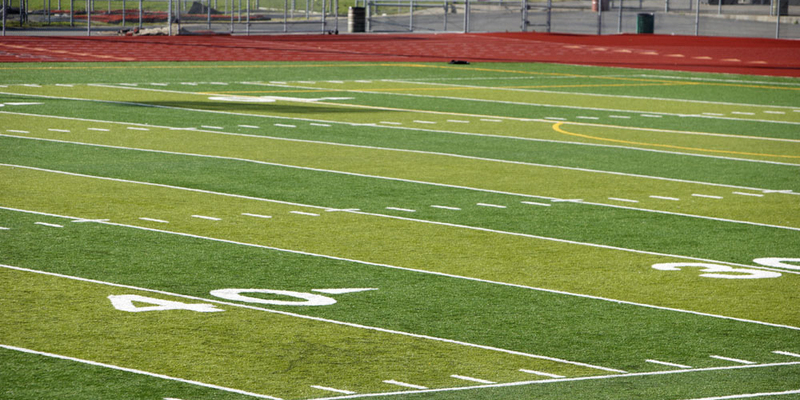 When Oakland International High School won the funds to build a new field for multi-use sports to serve their active community of 350+ students, they went for faux grass. It makes sense, and they joined a statewide trend with their choice. Artificial turf for campuses is the smart way to go,at a time when schools across the SF Bay Area are looking for ways to cut down on their water use. The drought has raised talks among students, alumni, parents, and admin staff at high schools, colleges, and universities all over CA. Sports lawns use a lot of water, and when you switch to a faux field, your campus water costs drop. Waterless faux sports lawn stands up to more wear and tear than live lawn, and won’t rub down to dirt patches or bare spots where players can slip. Of course, there is more to a sports lawn than how smooth or tough it is, or even how many gallons it can save. Sports are fun, and their fields can be too! Fans go wild for statement sod like the bold blue field that the Boise State University Broncos play on. No matter the color, artificial turf for campuses makes the grade. Live sod can use as much as 55 gallons of water per square foot per year. When you think of the fact that a stadium is about 80,000 square feet in size, those numbers sure add up! It’s not just about what’s good for the Earth. It’s about what’s good for the bottom line. Water costs are high right now due to the drought in the SF Bay Area. That math has helped make synthetic turf for stadiums a trend. Over a 10-year span, the price of water plus the fact that fake lawn lasts longer than a live field has a huge impact on operating costs. In fact, when you crunch the lifetime budget for your field, you will find that an hour of play on fake grass may cost as little as a quarter of what you’ll spend for an hour of game time on a live lawn. Now, what if you found out what faux grass was safer for players as well as for the planet?A 5-year football study showed that injury rates for games on faux lawn were up-to 66% lower than games on live grass. Talk to us about the sports grass we carry, and how it makes great synthetic turf for stadiums. Contact Watersavers for all of your sports field turf needs. We offer a full range of sports grass, plus all the tools you could ask for to install and care for a faux field. Come visit one of our stores in the SF Bay Area, get a free estimate, chat with us online, or give us a call at 844-974-8873.